It's been a while since I've had a post primarily about food. So it's time. I went to a wedding over the weekend. 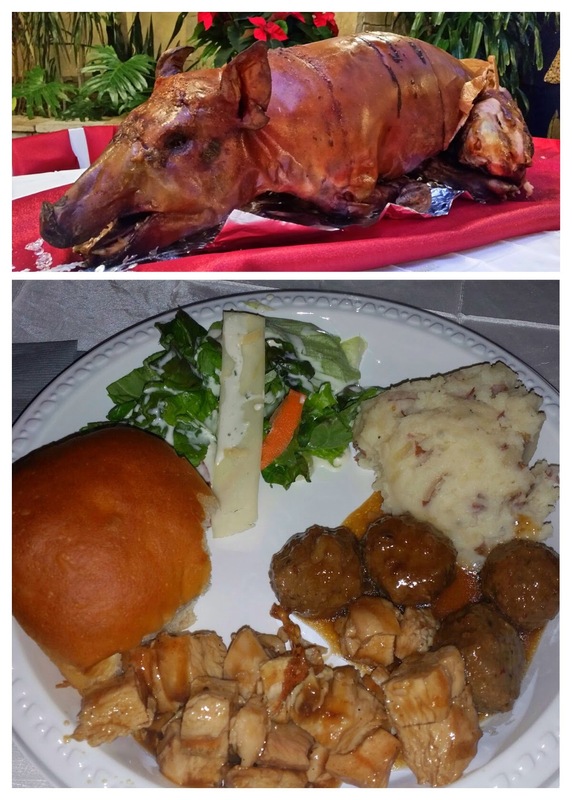 There were roasted pigs displayed on the head table and served with dinner. 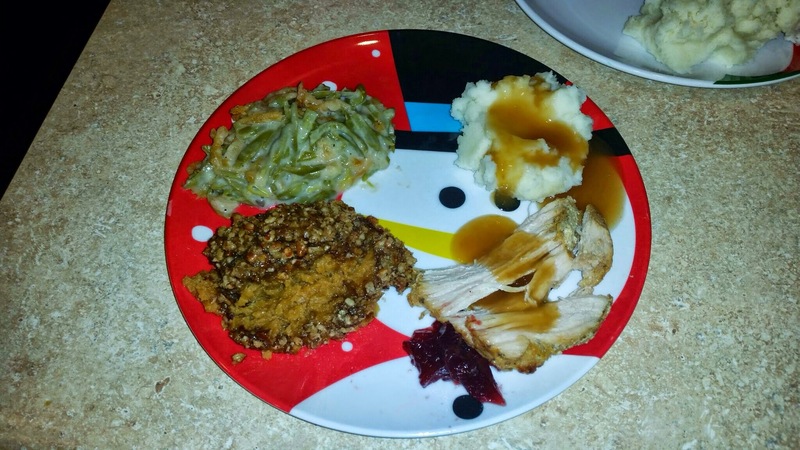 You will notice there is no roasted pork on my plate. 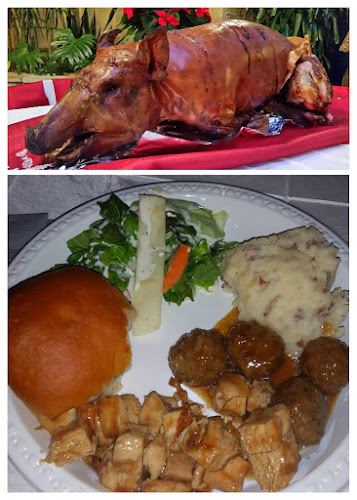 Seeing it still in pig form before they served it was a little too much for me. After the wedding we made a quick stop at Trader Joe's because I have been craving their mini chocolate peanut butter cups ever since I finished off the ones Janae gave me for my birthday. 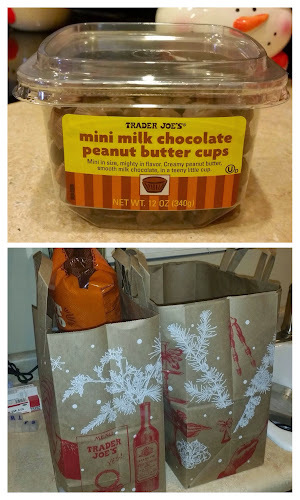 We left with a few more things than just (four containers of) the peanut butter cups. Ever since Thanksgiving, I've been saying I would make our own little Thanksgiving dinner so we could enjoy the leftovers that we missed out on because we went to my aunt's house. Sunday I finally got my cooking groove on and cooked a turkey breast, mashed potatoes and gravy, green bean cassarole and sweet potatoes. For dessert we had pumpkin cake with cream cheese frosting. We have all been enjoying the leftovers the past few days!! I still haven't figure out why some of these foods make an appearance only once a year when they are so very yummy. 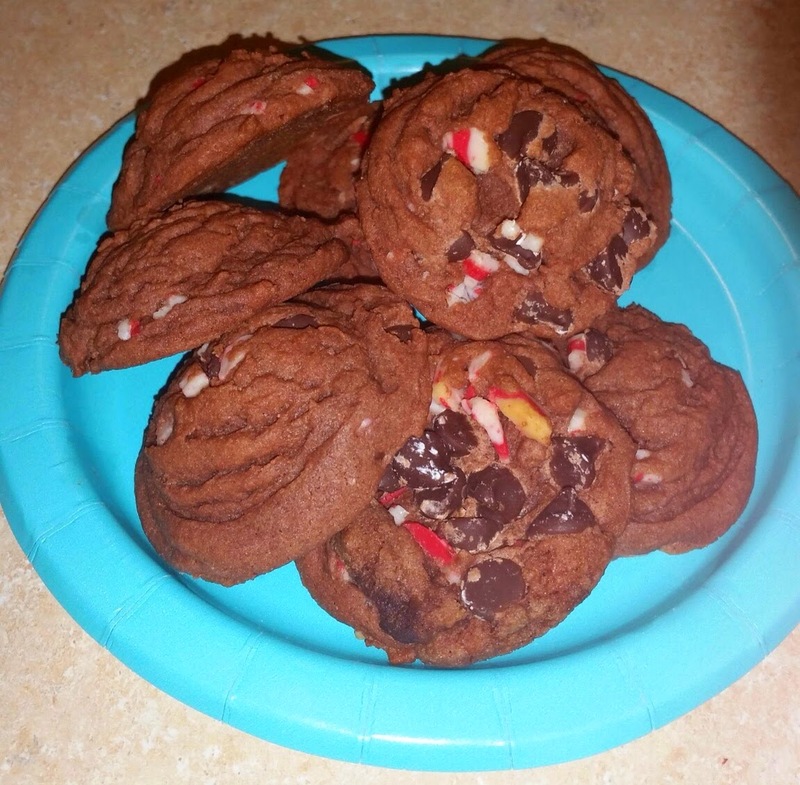 After Megan dropped these off the other night, I learned that treats baked with love have half the calories so I didn't feel too guilty polishing off every cookie on the plate (minutes the two bites I shared with my girls). For the record, they tasted like minty chocolatey heaven and I could feel the love in every bite. And no post is complete this time of year without something Christmas related. 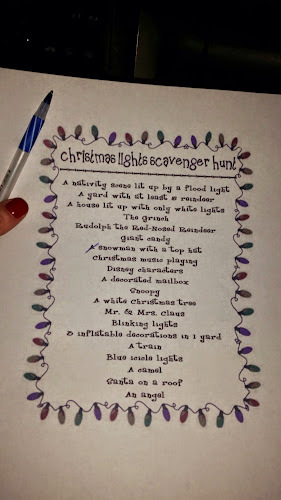 Last night we took the girls on a Christmas light scavenger hunt. It was a lot of fun. It was surprising that some of the things we thought would be easy to find weren't and some that we thought would be hard were everywhere. 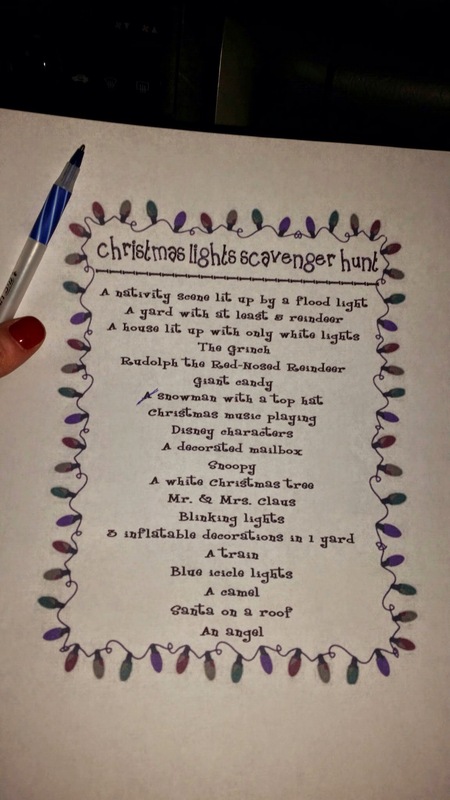 I have this version of the scavenger hunt pinned on my Holidays Pinterest Board if you need something fun to get you in the Christmas spirit in the next week! Because Christmas Eve is ONE WEEK FROM TODAY!! As far as running goes, my calf is feeling almost back to normal. The hubs massaged it last night and it didn't hurt at all during my run today. I am still loving running however far and slow I want. But I'm also looking forward to starting marathon training next month, pushing myself more, setting goals and working toward an end goal! Be sure to come back on Friday for some fun running gift ideas and some even more fun ideas that have nothing whatsoever to do with running. That scavenger hunt looks like a blast. And I love the idea of others baking having half the calories. I am glad you enjoyed the cookies with less calories:) Your dinner sounds heavenly-you nailed all my favorite things (minus the stuffing. I love stuffing) And that scavenger hunt is a good idea. You are the queen of Christmas. Love your face. We better play when you get back. Drive safe!!! Laugh. Cry. It's all here. We like winners around here! Family, faith...and Buddy the elf.